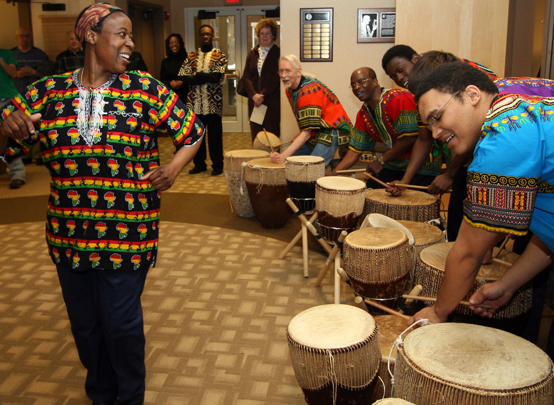 Performances by Wamidan, the College’s world music ensemble, led off the celebration, which concluded that evening with a dinner featuring keynote speaker Professor Benson Onyeji of Manchester College. The occasion was also the kickoff event for the Wabash chapter of the Africa Network, a national consortium whose mission is to develop and promote the study of Africa in liberal arts institutions. The Malcolm X Institute of Black Studies (MXIBS) Permanent Eiteljorg Collection of African Art combines two collections formerly housed at the College’s Fine Arts Center—objects from Harrison Eiteljorg’s collection of African art; and those from the MXIBS’ own smaller collection. "Wabash is incredibly lucky to have objects from Harrison Eiteljorg's African collection, which is considered one of the best private collections in North America," said Wabash Associate Professor of Art Elizabeth Morton, who welcomed participants at last Tuesday's opening. An art historian who served as curator of the National Museum and Art Gallery of Botswana and studied extensively in Zimbabwe, Professor Morton explained how the Eiteljorg and MXIBS collections were brought together after a show of the MXIBS works at the Fine Arts Center last fall. "We began discussions with [MXIBS Director] Tim Lake about returning the MXIBS works to the Institute and creating a permanent display for these works there. We also discussed bringing in some of the works from the Eiteljorg Collection to make it a more interesting and robust exhibition. "The MXIBS is an ideal place to bring together these two collections. The Institute is, in essence, a place to celebrate Africa and its heritage." Morton added. "These works from Africa look beautiful in the African centrally planned space. After wandering from the Continent to Eiteljorg's mansion in Indianapolis, to the Fine Arts building, they have finally found a home!" And with Wabash joining the Africa Network, Morton noted, this was the perfect time to install this show. Holding an Ashanti chief’s staff from Ghana that he’d brought home from his study tour of West Africa, MXIBS Director and Associate Professor of English Tim Lake welcomed guests and officially opened the exhibition. 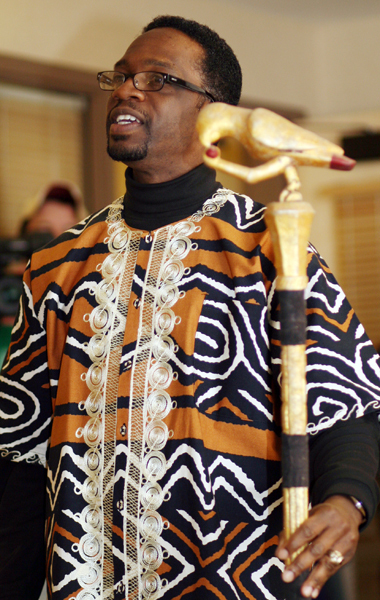 "For both Malcolm X and the field of Black Studies, Africa plays a primary role," Lake said after the event. "Malcolm is remembered for his visit to Mecca, but we should also remember that he visited several African nations. African governments received Malcolm as if he were a Head of State. Malcolm understood himself as an African who was returning home from a long journey. "Likewise, as an academic field, Black Studies takes Africa as its point of departure for exploring the experience of African Americans and other African diasporians. Therefore, it is fitting that the MXIBS make a cultural as well as historical connection between the peoples of Africa and those of the larger Black world." Professor of Music and Wamidan Artistic Director James Makubuya was enthused by the turnout and cooperation between the art and music departments and MXIBS for this first Africa Network event. "This collaboration was a great way to demonstrate that the only way the Africa Network can and will work on our campus is through the collaboration of all interested people bringing all available resources together," Makubuya said. "The Africa Network fits the role of the Institute, one of whose goals is to introduce, develop, accommodate, and enhance Black Studies or the college and beyond. The MXIBS is therefore the ‘home’ of the Africa Network on our campus, and Professor Lake is one of the major founding members." "Professor Morton has also put in a lot of work establishing the College's chapter of the Network," Makubuya added. "As a staunch ‘Africanist’ scholar and artist, Professor Morton’s professional help was a big asset in both the planning and execution of our kick-off celebration." Following the event, Wabash art history students gave "tours" of the new exhibit, offering information about pieces in the Collection, which can be seen at the MXIBS building during working hours, Monday through Friday.